The Bungee Trampolines are fast becoming one of the most popular children’s attractions around, and it’s easy to see why! With the aid of bungee ropes, children are able to reach new heights that they would not be able to achieve on a regular trampoline. With the added safety of the harness, they are also able to do flips! It’s a high energy activity and so is a fun form of exercise. The child is strapped in to a specially designed safety harness that passes around the waist and each thigh, then fastens securely with a click system buckle that the child will not be able to undo themselves. 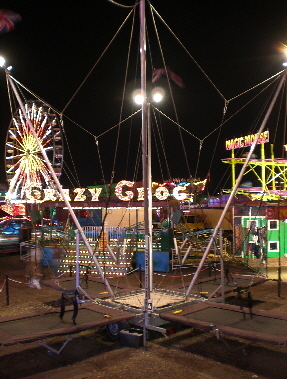 Bungee ropes are securely attached to each side of the harness. The operator then winches the bungee ropes upwards while the child starts jumping on the trampoline. 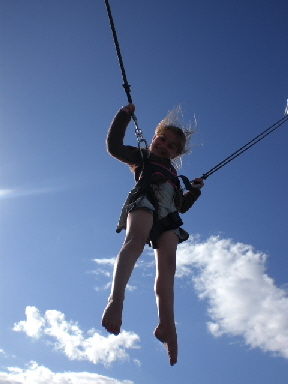 The higher the bungee ropes go, the higher the child will be able to jump - as long as they can maintain momentum! With instruction and supervision from the operator, confident children will be able to achieve back flips and front flips! Is there enough space on the ground? 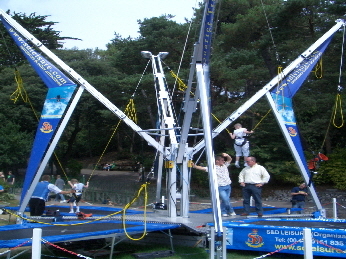 The Bungee Trampolines require a space of 8.5m X 8.5m. You must then also consider the space for people to move around the outside of the attraction if they are to be placed in a main area or walkway. Is there enough height clearance? The Bungee Trampolines require 7m clear headroom with no overhanging trees or cables etc.